Daniel was born in Melbourne and moved back to Germany with his family when he was six. From an early age he dreamed of one day becoming a pilot. In 2000 he returned to Australia to study at Torchbearers Bible School. There he heard about MAF and enrolled in the Mission Aviation Course at the Bible College of Victoria in 2003. Silke grew up in Bavaria (Germany) with French/German parents. Daniel and Silke met in High School and got married while Silke was still at school. The Roth joined MAF Australia in 2004 and moved to Gapuwiyak (Arnhem Land, NT) in 2005. They quickly got adopted into a Yolngu family and adapted well to being part of it. 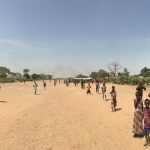 Participating in Kids’Club, the local church, collecting weaving materials in the bush, and going hunting with the men were all highlights they enjoyed, being part of the community. Zoe (and Silke) were enrolled with Katherine School of the Air as a home schooling program. After Daniel badly injured his back in 2007 the Roth family spent some time in Yirrkala , NT, where Silke took on work in the MAF reservation office. When Daniel was fit to fly again they moved back to Gapuwiyak seven months later to resume their work. In 2009, the community asked Silke to take on a managing role in the newly founded Culture and Art Center. She filled that role until they left the community in 2013. 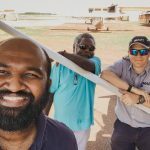 Besides being Base Manager in Gapuwiyak, Daniel became part of the MAF Check and Training Team and took on the role of Operations Manager in MAF Arnhem Land. After years of homeschooling, Zoe’s needs were not met anymore and Daniel was looking for a new challenge after flying single engines for over eight years. Daniel accepted an offer in the MAF Mareeba Maintenance Program in Queensland to be trained as an Avionics Engineer. In February 2013, they moved to Mareeba and Zoe started school in the local St. Stephen’s High School. After his training, Daniel will be highly skilled for many other MAF programs around the world looking for personnel.